Guanajuato is a very photogenic town, so I may have overloaded this page with photos. So while they load I’ll tell you a story about our last visit. This second video came about because we had met a delightful group of students at the university, through visiting an English class. Kelly spontaneously came up with the idea of videoing them as they strolled along some of the walking streets and had a meal together in a quiet plaza. We had a lot of fun shooting the video, and we’ve sold it steadily to the U.S. educational market, as well as to people who want to practice understanding Spanish. It’s not for beginners — the students talk at a normal pace, which is pretty fast! 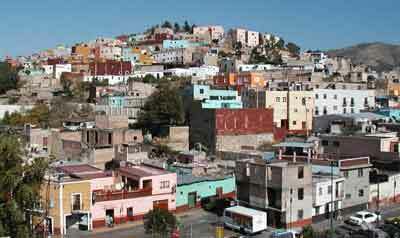 Guanajuato is a city of many hills, rather like San Francisco though much smaller. This hill is a residential area, within walking distance of downtown. To go downtown, the fastest way is to take a five-minute walk through a tunnel called “Tunel Santa Fe.” It’s a little fumey from the cars that also use the tunnel, but we do go this way quite often, as we are staying in this area. Once we climbed over the hill that the tunnel goes through, but that is definitely the hard way. The prettiest way is to go around the hill on some streets that offer a lot to see… a huge school, a police station with the most cheerful bunch of policemen and women that I’ve ever seen, lots of people selling produce and food on the wide sidewalks, and more. 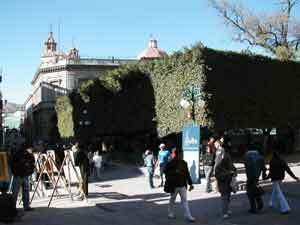 Here’s an art show going on along the edge of the most famous plaza, the triangular Jardin de la Union. No cars go through here — there are many pedestrian streets in Guanajuato, more than when we were last here. That’s very pleasant, as strolling the narrow streets that you do share with cars does call for some alertness! 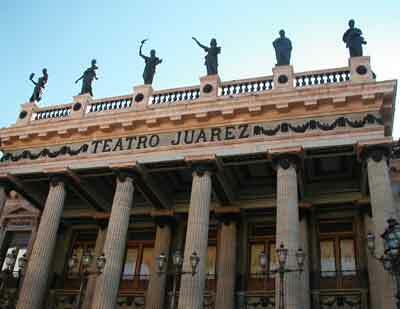 The Teatro Juarez, on one side of the Jardin, is the venue for concerts, plays, and performances from all over the world. 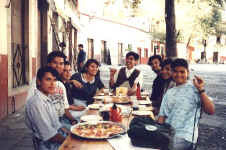 When we were shooting Mexican Pizza, the script called for the students to go to a cafe right near this ornate theater, but when we got there, a large group of people were speaking Russian. That wouldn’t have been quite the thing for the video, so the students took us somewhere us. That evening, Kelly and I went to the Russian ballet in the Teatro Juarez. 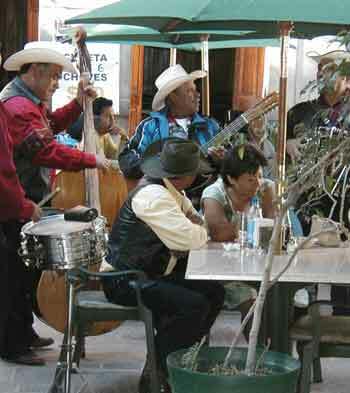 There are several cafes and restaurants along the side of the Jardin, and here a Mexican musical group is serenading this couple… no doubt the man requested it. There are also mariachi groups in the Jardin, but they wear the full mariachi regalia. This group was singing the Mexican equivalent of a country and western tune. 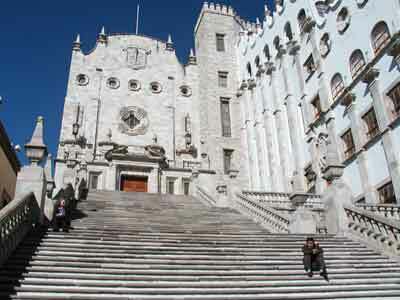 The steps of the University of Guanajuato are a popular place for people to sit and relax, meet friends, nibble a snack, or do a little studying. We took this picture during the Christmas holiday break, when many of the over twenty thousand students had left Guanajuato to go home for a few weeks. No, this isn’t Rome, though it has a deliciously antique feeling to it. 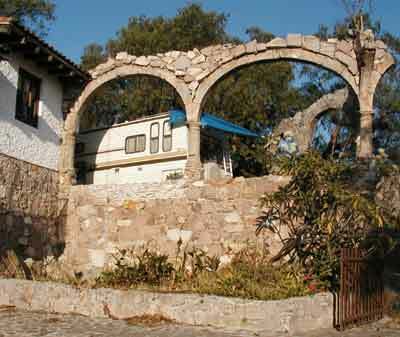 It’s just a little patio in a former hacienda which is now a trailer park. That’s our 21-foot motorhome, with a tarp rigged up for shade. 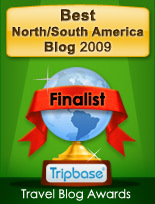 We stayed here a month this time, and still didn’t explore everything Guanajuato has to offer! Here’s a delightful photo slide show of a street scene near the market, taken by my husband.